(33 cm), 184 (4) pp., illustrations. 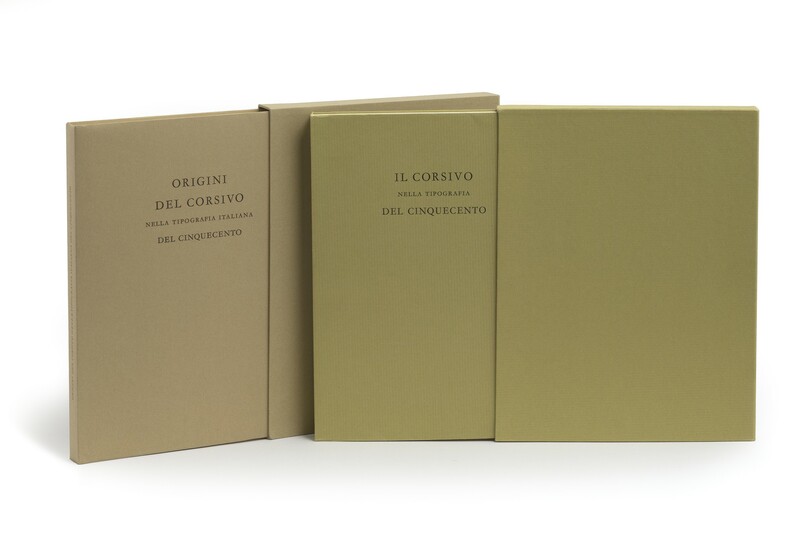 Publisher’s stiff green paper wrapper and green slipcase, within publisher’s plain card shipping case (printed lettering-piece: Documenti VI Origini del corsivo). - “An immensely valuable pioneering work. The information in it will take years to digest” (from a review by Nicolas Barker, in The Book Collector, Winter 1969, pp.523-525). The authors divide the work almost equally, with Balsamo discussing in five chapters the first italic of Aldus Manutius and Francesco Griffo, other italics of Francesco Griffo, the italics of Benedetto Dolcibello, the italics of the Paganinis, and the spread of italic; and Tinto in three chapters Ludovico degli Arrighi, the Vicentino-inspired italics, and the italic of Tagliente. Practically every other page is given to illustrations. Reprint of the limited edition of 1967 (600 copies). ¶ Excellent copy. (23 cm), 162 pp., including 30 plates. Publisher’s stiff green paper wrapper and green slipcase, within publisher’s plain card shipping case. - A study of italic printing types of the sixteenth century in their development beyond the origins in Italy. Edition of 850 copies (600 for sale) printed by Giovanni Mardersteig at the Stamperia Valdonega, on paper specially made by the Cartiera Ventura. Giovanni and Martino Mardersteig… Catalogue of the exhibition celebrating sixty years since the founding of the press Stamperia Valdonega, 1948-2008 (New York 2008), no. 7. ¶ Excellent copy. Title lettered by hand on spine of the shipping case; otherwise an unmarked copy.